Rustic kitchen design almost always suits older homes. Think rustic and you likely picture country manor houses and cosy cottages. Despite these traditional locations being most popular for the look, there’s nothing to stop a less rural home incorporating a rustic kitchen into its design. Although it is worth keeping in mind that such a design may not work in a home that focuses on the hyper-contemporary. To achieve the rustic look in your kitchen, think natural earthy tones, flagstone floors, stripped windowsills and rich, distressed woods. Traditional appliances and decorative features should come together seamlessly, while modern appliances are hidden away behind cabinets. All of these choices come together to create a room that feels both limitlessly traditional and, at its core, essentially contemporary at the same time. In this article, the Extreme design team will take a look back at the world of the historic and rugged – the traditional farmhouse, the Lake District cottage, the highland hunting cabin – giving you the resources necessary to design the rustic kitchen of your dreams. Rustic does not necessarily mean old, but it’s certainly a style that takes inspiration from the kitchens of the past. Old-fashioned farmhouse kitchens didn’t have access to the modern heating outlets that we do today and would always have to maximise any available warmth. As such, the foundation of the rustic kitchen is to design with warmth in mind. Warm earthy tones of brown, grey and orange are a great backbone for your kitchen, especially when positioned alongside stone flooring and natural wooden accents. For that truly rustic effect, position any furniture close together and around a heat source such as a range cooker. Especially when done with darker traditional wooden furniture, this makes for an exceedingly warm and cosy design feature. Modern kitchen design tends to prioritise the refined, sleek and unblemished. Rustic kitchens, on the other hand, relish in imperfections and often benefit from a distinctly stripped back look. 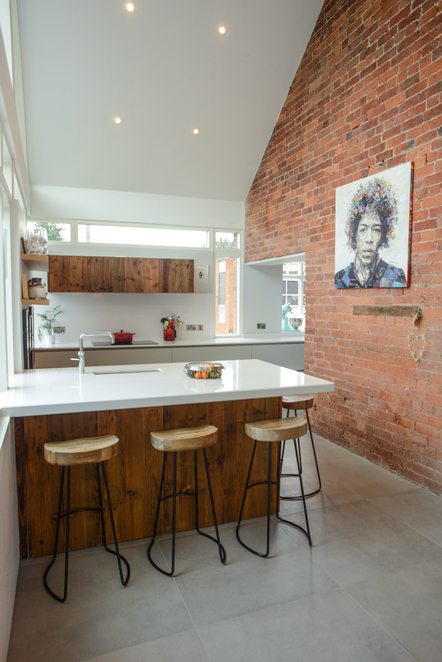 Rather than glossy worktops and slimline islands, more natural designs lend themselves beautifully to the rustic kitchen. Whether they be unpainted, knotted ceiling beams, sanded down floorboards or chunkier islands and cabinets, the imperfect adds an additional layer of character to the rustic kitchen. Along with stripped back cabinetry and furnishings, choosing stone walls and floors is another great choice for the rustic kitchen. Even with a stripped look embraced in all areas of the kitchen, you shouldn’t be afraid of introducing some contrast for effect. 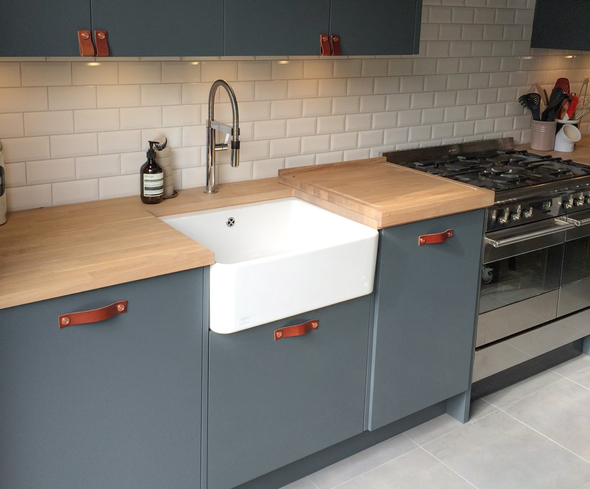 Sleek, modern worktops and cabinets can look remarkably fresh when installed into a more old-fashioned kitchen. 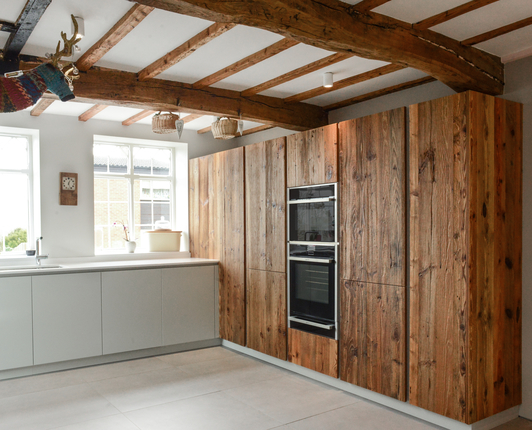 In this Extreme kitchen, we paired modern white cabinetry and worktops with rustic doors made from Scandinavian cladding, to create an ‘old meets new’ feel. One of our favourite things to do when working within the framework of a rustic kitchen is to bring in reclaimed antique features. For that decidedly rustic look, there’s nothing better to introduce to the kitchen than the antique, especially if you intend to bring a more luxurious touch to the room. From antique lighting fixtures – even after a hundred years, chandeliers won’t lose their luxurious touch – to repurposed church furnishings, choosing antiques lends a unique touch to the rustic kitchen. The beauty of the rustic kitchen is that you are also able to incorporate antique appliances, or at least those that look antique, that could look highly out of place in a modern kitchen. The most obvious example of such an appliance is the range cooker. The best ranges can be found in fully-working order decades after they were built and certainly introduce a lot of character into the room, setting up your kitchen for a lifetime of cherished memories. Farmhouse sink bowls and wooden worktops also lend themselves well to a rustic kitchen, bringing a feeling of simplicity to the design. Whilst rustic doesn’t have to hail the past, drawing on certain eras is another way to create a rustic feel. Mid-century furniture, for example, is often predominantly made from wood and any colours used would be applied with a matte finish – no high gloss here! We were recently developing a rustic kitchen design, shown below, and experimented with a mid-century feel by adding soft curves and legs to the furniture. The rustic look may not be suitable for everyone’s taste nor home, but for some it will lead to the creation of a beautifully unique and characterful kitchen space. When well-designed, a rustic kitchen will be a timeless statement room for your home and a joy for you, your family and all of your guests for years to come. To create a timeless rustic kitchen for your own home collaborate with an Extreme designer. Make an enquiry with our studios today and start planning your next kitchen project.